1-800-4-Alarms monitored security system save me money? An 1-800-4-Alarms monitored home security system can save you up to 20% on your homeowner's insurance base premium with most insurance companies. 1-800-4-Alarms will provide you with a certificate to send in to your insurance company, showing that your home has monitored security protection. Your home will be monitored 24 hours a day through the 1-800-4-Alarms system. In the event of an emergency, the system transmits a signal to the 1-800-4-Alarms monitoring center. The monitoring center attempts to contact the homeowner via phone after the signal is received. If the person who answers the phone cannot supply the personal indentification code, or if no one answers the phone, the representative then can notify local authorities. Local authorities are then dispatched to the home to determine the cause of the disturbance and to respond to emergency situations. Why should I choose 1-800-4-Alarms home security monitoring service? 1-800-4-Alarms monitored home security systems offer the peace of mind that comes from the best protection and service available anywhere. 1-800-4-Alarms monitored systems are much more than simple fire or burglar alarms - they offer security for your home and family, with the important benefit of notifying emergency services (fire department, police, etc.) in the event of an emergency at your home - whether you're home or away. 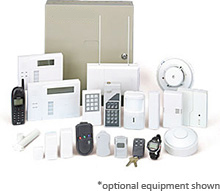 What is included with my free 1-800-4-Alarms home security system? Three Door contacts to detect anyone entering your home. One Motion sensor to detect movement inside your home. One Interior alarm siren to help warn you of emergencies. One alarm system touchpad for setting and controlling your system. Window stickers and yard signs to help keep intruders off your property. Optional - Smoke and Heat Sensors, Carbon Monoxide Detector, Water Sensors, and Freeze Sensors. Please call 1-800-4-ALARMS for complete details. Can you supply a side-by-side 1-800-4-Alarms vs. Other Companies? If you've narrowed your choices, it's possible that you're left deciding between 1-800-4-Alarms and Other Programs. When comparing systems, pay attention to what is and what is not included. Check out this simple comparison chart to see the differences between 1-800-4-Alarms and Other Programs. When will my 1-800-4-Alarms home security system be installed? 2-Way Voice is a convenient, hands free feature that allows you to communicate directly with an 1-800-4-Alarms monitoring center person from almost anywhere in your home. The control panel acts like an intercom over which an 1-800-4-Alarms monitoring center person can verify an emergency in your home and ask you for your password code. The microphone in your control panel is so strong that it can pick up a normal talking voice from over 75 feet away, so you can communicate with a monitoring center person even if even if you're injured and can't make it to the control panel.